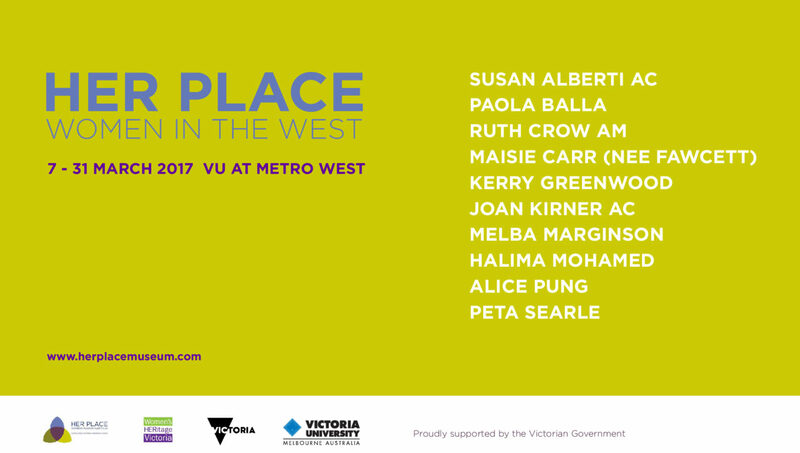 Her Place: Women in the West honoured the lives and contributions of women in Melbourne’s west. The second in a series of exhibitions presented by Her Place Women’s Museum, it celebrated the work, achievements and historical significance of women through moving image, photographs, biographical accounts and personal artefacts. The exhibition told the stories of ten women from the western suburbs of Melbourne. These women have contributed to Australian society at both national and local levels through their work as artists and activists, writers and scientists, businesswomen, lawyers and community leaders. The group includes a former state premier and the AFL’s first female coach. Six of the women featured in the exhibition have been inducted onto the Victorian Honour Roll of Women. Established in 2001, the Honour Roll pays tribute to women who have been pioneers in their field and who have improved the lives of women and the broader Victorian community. Each year, at the time of International Women’s Day, a new group of remarkable Victorian women is inducted onto the roll, thereby creating a significant record and increased awareness of the achievements and contributions of women in this state. The lives and experiences of women have traditionally been under-represented in historical narratives, museum collections and the public sphere. Many women from the west have been additionally marginalised due to issues of race, economic status and access to education, thus making ‘Her Place: Women in the West’ a rare opportunity to pay tribute to the many women who have risen above the challenges they have faced to make a mark on Melbourne’s west and beyond.